After seeing its U.S. military presence depart in the post-Cold War era, Iceland is again becoming a strategic location. Will that be enough to help it secure a trade deal with the U.S.? The United States and Iceland have a long history of bilateral agreements. In 1951, the United States agreed to provide military protection for Iceland in exchange for using the strategically placed island as a Cold War outpost. But with the end of the Cold War, Iceland’s location became less important for the U.S. and in 2006, the last permanent American troops were withdrawn from the island. However, with the rapid ice melt brought by climate change and an accompanying uptick in economic interest in the Arctic, the region may once again experience threats of conflict. In that case, Iceland’s minister for foreign affairs argues, the country may once again be a useful partner in American security. In the meantime, he’s looking to strengthen U.S.-Icelandic relations via another route — trade. The optimism in international relations at the end of the Cold War has “dramatically receded,” Gudlaugur Thór Thórdarson said last week at Center for Strategic and International Studies in Washington, D.C., and he highlighted questions that have arisen about potential conflicts with Russia that may extend into the Arctic. He called Russia’s 2014 actions in Crimea a “game-changer,” and the recent assassination attempt against a British citizen a “shocking development — one that only widens the gulf between the West and Russia.” And, of course, there is the suspected interference in the 2016 elections in the United States. In the Arctic in particular, Thórdarson said, they’ve seen more submarine activity from Russia, with potential cruise missiles threatening the American mainland. Last fall, U.S. forces returned to Iceland, and the American military made plans to upgrade its facilities there. Such an investment seems to indicate U.S. awareness of potential threats in the Arctic. Iceland is the only founding member of NATO without a standing national defense force. The escalating security situation has also had economic effects, Thórdarson says. As part of the sanctions against Russia, Iceland saw a 95 percent drop in trade to Russia, which resulted in Iceland’s GDP declining by 1 percent. Thórdarson is now looking for a different kind of solidarity — one that might recoup some of those losses. In 2013, Iceland became the first European country to sign a bilateral trade agreement with China. “My only remark is the fact that we do not have a similar free trade agreement with the United States — our closest ally and most important market,” Thórdarson said. He used his visit to Washington to reiterate that point and negotiate for a trade deal. He also highlighted a one-third increase in tourism in 2017 from the U.S. to Iceland — 680,000 Americans now visit every year. However, experts say that Thórdarson may have a long wait before he sees a trade deal with the United States. The State Department’s stance is that “the United States seeks to strengthen bilateral economic and trade relations” with Iceland, but such a trade agreement is likely low on the list of priorities for this administration, observers say. 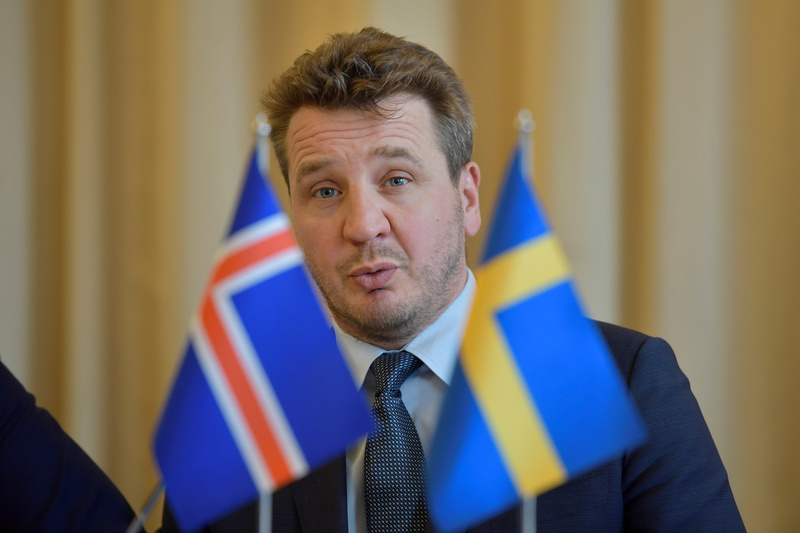 Although the U.S. represents a major market for Iceland, the island nation is just the 102nd largest trading partner for the U.S.
“There is very little prospect of a bilateral trade deal between Iceland and the United States in the immediate future,” says ​Dan Hamilton, the Austrian Marshall Plan Foundation professor at the Johns Hopkins University. Although the administration has stated a preference for bilateral rather than multilateral agreements, the next priority for a new bilateral agreement in Europe would likely be with the post-Brexit U.K. government, Hamilton says. But as Iceland’s place in the Cold War shows, its bilateral agreements with the United States have a long history. Iceland may be prepared to wait.